K ali symbolises the cosmic power of creation. She represents all three dimensions of life – ‘creating’, ‘preserving’ and ‘destroying’ in sequence. In Hindu philosophy the world is manifested and maintained through the dance of Shakti (the feminine principle) while the masculine principle remains passive – initiating but not creating. Although neither aspect can be seen as separate or superior. The power given to the vengeful goddesses of the Indian tradition makes for the most dramatic female iconography in the world often combining bloodthirsty acts with both grace and glamour. Kali has the same ambivalent aspects as the ancient goddesses of the European pre-Christian tradition and she probably predates the Aryan invasion of India with her dark colouring and blood sacrifice rituals. This stained glass panel is based on this eighteenth Century Kalighat gouache of the Hindu goddess Kali held by the Victoria and Albert Museum. As a symbol of the ultimate power of nature to both give life and take it away Kali’s position in the pattern of the rose window marks both the end and the beginning of the cycle. She relates to the ‘dark moon’ phase of the lunar cycle. This period between the death of the old moon and the rebirth of the new was always seen as both the most creative and the most dangerous time of the month. Note the word ‘lunatic’ comes from this root. 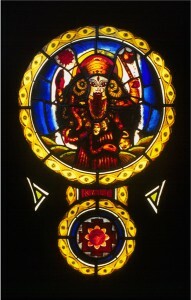 Kali’s dual nature is reflected by her right and left sides. In her upper left hand she carries a bloody axe and in the lower the severed head of a giant to show her capacity to destroy. In her right upper hand she carries a lotus (symbol of inner perfection, contemplation and peace) while her lower right hand makes the ‘mudra’ (gesture) of granting boons. This represents her role as preserver and protector of those who both fear and respect her power. Kali’s hair is wild and unbound to express her uncontrolled nature and she wears a necklace of skulls; her tongue is outstretched to ‘lick up the world’ but her mouth is usually slightly smiling and her face calm. The snake she carries in her right hand is a symbol of both sexual energy and Shiva – her hidden consort. The geometry in the small moon is the Kali Yantra – a geometric symbol as potent in abstract as her manifest image. Kali’s black face is associated with death and her wild dancing image on the cremation ground. Other aspects of Kali are less terrifying – her white face is static rather than dynamic and associated with liberation, red is associated with love.In the Tantric tradition a devotee of Kali must learn to love her in her most frightening form before they can graduate to other aspects. Love for Kali, the ‘Terrible Mother’ means the conquering of the fear of death and thus an acceptance of impermanence that is liberation from fear of life too. In the 21st century new levels of violence and destruction govern our lives. In our materialistic world; where our personal fear of death seems equal to our capacity to destroy life on a global scale; she comes as a much needed reminder of our human limitations.